Bill McKibben is an influential environmentalist author and activist. A former journalist who wrote a seminal book in the anthropogenic global warming movement, McKibben founded the environmentalist organization 350.org and has been involved in the People’s Climate Marches movement. 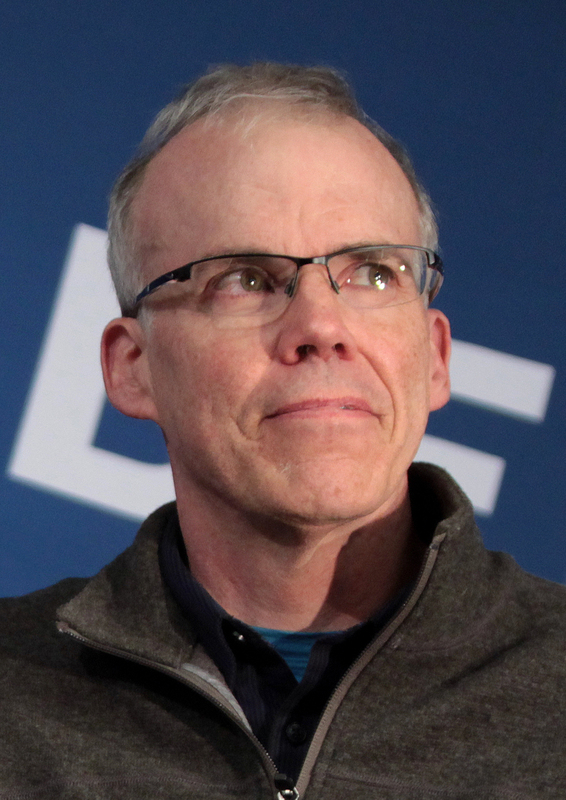 In 2014 McKibben was a key leader in the People’s Climate March, which was attended by prominent liberal environmental activists such as Former Vice President Al Gore, U.S. Senator Bernie Sanders (I-Vermont), and actor Leonardo DiCaprio, and which sought to support international United Nations-based environmental policies. In 2017, McKibben led a second People’s Climate March in Washington, D.C. in support of a 100% renewable energy mandate bill sponsored by Sen. Sanders in coordination with McKibben. William “Bill” E. McKibben was born in Palo Alto, California, in 1960 and attended high school in Lexington, Massachusetts. McKibben’s father Gordon was a journalist for Business Week and then the Boston Globe. In 1971, Gordon McKibben was arrested for protesting the Vietnam War. In 1987, McKibben left the New Yorker to work as a freelance writer and moved with Halpern to upstate New York. According to McKibben’s writings while he was living “on the edge of the wilderness” in upstate New York, he “finally found” the liberal cause he could take up as his own, environmentalism. Further Matthew Nisbet a fellow at American University’s Shorenstein Center on the Press, Politics and Public Policy wrote that McKibben argues that technology will not be able to fully remediate climate change and thus concludes that the “only moral path to survival” is to transform what McKibben called “the defiant, consumptive course we’ve traditionally followed” by compelling a more minimalist lifestyle and a reduction in world population. However, other reviewers took issue with McKibben’s views of nature over humans, and his broad environmental pronouncements. Bill McKibben has written at least thirteen books, one catalogue of personal writings, and edited a compilation of various global warming articles. McKibben also writes numerous magazine articles, major newspaper op-eds, and blog posts annually to compliment the themes in his books. His writings have appeared in the New York Review of Books, The Nation, Rolling Stone, the New York Times, the Washington Post and online outlets such as Huffington Post and the Nation Institute’s TomDispatch.com. He has also written on environmental issues for Outside, National Geographic, Audubon, and Sierra magazines. In 2010, McKibben and his 350.org group organized a global day of action that sought to secure “an international binding agreement on emissions at the December 2010 climate summit in Copenhagen, Denmark.” McKibben took credit for organizing 5,500 actions in 181 countries; no binding agreement was reached. McKibben has led numerous protests in opposition to the pipeline. In August 2011 he was arrested at the White House for protesting the pipeline and spent two days in jail. Then in November 2011 he led a 5,000-person protest at the White House hoping to convince President Barack Obama to block the pipeline project. McKibben was again arrested protesting against the pipeline at the White House in 2013. McKibben was also arrested for similar protests in 2015 against Exxon in Vermont and in 2016 against a proposed gas storage project at Seneca Lake, NY. Joining McKibben and 350.org in pressuring the White House against the Keystone XL Pipeline were the Sierra Club and the Obama administration’s former “green jobs czar” Van Jones. In 2014 the first “People’s Climate March” was attended by approximately 310,000 people and was attended by other a number of high profile environmentalists including Leonardo DiCaprio, Jane Goodall and Vandana Shiva; policymakers such as Senators Sheldon Whitehouse (D-R.I.), Bernie Sanders (I-Vermont), Charles Schumer (D-N.Y.); then-U.N. Secretary-General Ban Ki-moon; and former Vice President Al Gore. The march, which took place in New York City, was coordinated to coincide with a United Nations meeting that would discuss environmentalist initiatives. In 2017, McKibben’s 350.org was a “key organization” for another People’s Climate March that took place in Washington, D.C. According to NPR, McKibben hoped to use the D.C. march to oppose environment-related policy decisions by the Trump administration. During the 2016 presidential election, McKibben served as a proxy for Democratic presidential candidate Bernie Sanders, and was one of Sanders’ appointees to the Democratic Party’s platform drafting commission. While serving on this commission, he proposed seven climate related amendments, including “a fracking ban, a carbon tax, a prohibition against drilling or mining fossil fuels on public lands, a climate litmus test for new developments, an end to World Bank financing of fossil fuel plants.”  All but one of his proposals were too radical for a majority of the other Democratic Party delegates and were thus defeated. The Clinton campaign subsequently accepted some of McKibben’s less extreme proposals.